At Fell Dyke we believe reading is one of the most powerful tools of learning both in and out of school. It facilitates independence and provides opportunities for children to gain both understanding and pleasure from a range of texts. master the basic mechanical skills of reading. read with accuracy, fluency and expression. develop and use higher order reading skills which will contribute to their overall comprehension of texts. understand the value of information texts as an aid to learning. develop a love of literature and an understanding of the pleasure reading can bring. Dedicated daily phonics sessions taught within Early Years and Key Stage One and planned intervention within Key Stage Two. Carefully planned guided reading sessions that address a range of reading skills and teach a variety of reading strategies. Daily opportunities for children to apply reading skills independently. Carefully planned daily English lessons that follow the requirements of the new national curriculum for reading. Targeted intervention for those pupils who are working below age related expectations through programmes such as ‘Every Child a Reader’ and ‘Boosting Reading Potential’. The use of ‘Accelerated Reader’ from Y3 to Y6 to encourage a love of reading and to build further on comprehension skills. 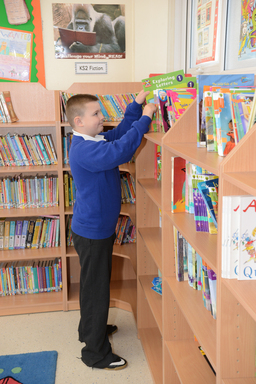 Regular reading at both home and school through the use of a whole school reward systems, celebration assemblies and extra curricular activities. A collaborative partnership with parents and carers through daily comments in individual pupil’s reading diaries, parent workshops and community reading events. Pupils to read widely, through our use of differing class texts, library visits and high quality attractive books in classrooms. Pupils to read for pleasure using reading partners, quiet reading time, listening to an adult read and cross curricular visits and activities linked to a range of books. We have a variety of phonics and reading schemes including: Letters and Sounds; Rigby Star; Oxford Reading Tree, Project X and Tree Tops as well as a variety of classic children’s literature and a well-stocked library for children to select books from. In each classroom there is a designated reading area to enjoy a book. A selection of non-fiction and fiction books are available to read for pleasure or to build on knowledge of creative curriculum or science themes.